You can be the proprietor of the local Royals hangout, even if it's in name only! 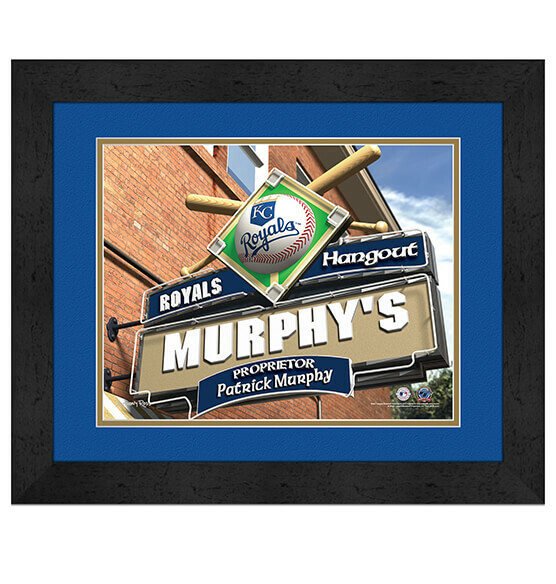 Our Kansas City Royals Personalized MLB Pub Sign Framed Print Art features a "sign of a sign" on a brownstone — presumably near Kauffman Stadium where all the locals hang out and critique the most recent game over a cold one. This easily customized, generously sized print adds team spirit wherever you decide to hang it: in your home, your office or your official Kansas City Royals fan cave. A quality MDF vinyl-wrapped frame, crisply printed paper and protective glass keep this Royals sports decor looking great. It arrives ready to hang with a sawtooth hanger.